INCHcalc is a refreshingly simple, easy-to-use fraction calculator. In going thru several fractional calculator apps, I’ve found the hardest part to be entering the fraction. INCHcalc makes it easy. In the example at left, you would hit 45 FT, 8 IN, 3 / 8. Once you do it, you don’t forget it. 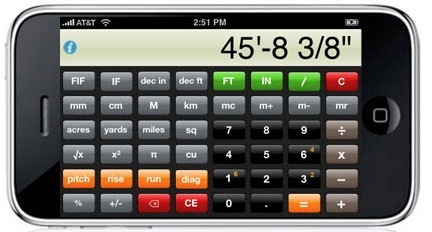 Other calculators I’ve tried are just not that intuitive. INCHcalc is simple to use. No clogging the screen with Pitch, Rise, Acre, etc – all stuff the average woodworker doesn’t use (though carpenters would). Buttons are big, and easy to use. The screen is very easy to see – though I might have been interested in a smaller fractional size display, with numerator over denominator, rather than side by side, but no big deal. • A button that would take the result in the window, and convert it to either metric or decimal. • The author’s website doesn’t show it, but it would be nice if the program had a metric equivalent – METRICCcalc, if you will. America, Liberia, Burma, and parts of the UK are the only countries still widely using the English system. I wish we were using the Metric system, then I probably wouldn’t need a calculator – which, thinking about it now, is probably why there is no metric version! Everything is based in units of ten, not 12s! 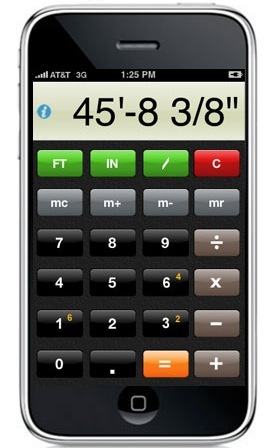 If you are a carpenter as well, and need functions such as Pitch, Rise, Volumes, Areas, and so on, there is INCHcalc Pro, at $4.99, which gives you INCHcalc as well, INCHcalc Pro kicking in when you turn the phone to landscape. To sum up, INCHcalc, is an app that I use all the time in the shop – it’s simplicity and ease of entering fractions make it a winner in my book.